Hey everybody, it's Tara! I have an exciting announcement to make...starting today Thursdays will be all about my favorite topic - ME!!! And why shouldn't I have my own column??? I am the tortie on the blog header, after all. What I want to know is what took Mommy so long to ask me! But I can't complain too much, I have it pretty good around here. As a matter of fact today I want to talk about how lucky I am. 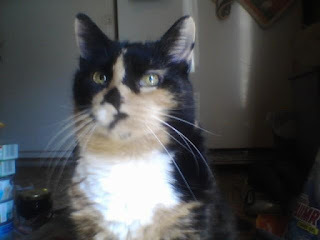 That might sound kind of strange coming from a kitty with as many medical issues as I have, but the truth is, if Mommy hadn't adopted me 6 years ago I probably wouldn't be here today. She loves me so much and makes sure I get everything I need. I've been diabetic and on insulin for two years now; since August of last year I have been on 4 different medicines for my heart problems; and I take a powder to prevent those awful urinary tract infections that hurt so much and an immunity-boosting supplement to slow the progress of whatever is growing on my spleen. I really think a guardian angel was looking out for me the day Mommy saw me at the shelter and fell in love with me at first sight. Many people would have given up on me long ago. Nine months ago we never thought we would still be together today; the doctors are even amazed by me. I call it the power of love. Note from Mommy: I'm the lucky one. Geez that looks like my medicine basket. Goof only gets one pill a day. I'll show him this pic the next time he complains. I think you're both lucky to have each other. Tara, you sure are a lucky girl for finding your Mom! So happy you are getting the love and attention you deserve! You are adorable too! Your mom is the lucky one for having you to keep her entertained! We're glad to hear that you get all of the medicines you need and that your Mom takes such good care of you with them. We know you're worth the extra work. Tara, you make my Sam's load look not so bad, even though he needs a pill case to keep all his medications straight. He's happy his medicine is all pills given to him in moist cat food. I don't think he's like shots! You are a beautiful kitty. I am so glad you are doing good. Your mom is very organized. 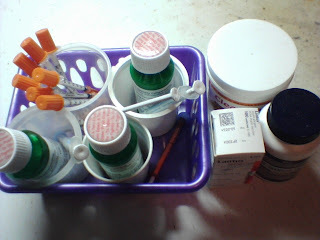 I have 3 kitties that have meds. I have a calendar I mark off so I make sure they all get their daily meds. You are a very lucky kitty to have a Mom that loves you so much and takes care of you. And you are a very pretty kitty, too. We're glad you will has a day to tell us all about you! Our mom takes medicines kinda like yours and we take care of her too. It's funny how it all works out. We thinks you AND your mom are both pretty lucky! I bet that could get pretty confusing having 3 on meds! With Sam I'm lucky, with Seneca and now Aleister (both cats) it's a crap shoot! The cats both have hyperthyroidism, Aleister was just diagnosed while Seneca has been on meds for years. Hi Tara, great news that Thursdays are about you! We are so glad to hear that you have such a loving home and mom takes such good care of you. You are this kitties angel. What a wonderful kitty Mom you are. Lovely kitty. Oh what a wonderful Mom you have Tara!!! We are so glad you got each other!! We are pleased to meet you both! !